If you follow Rewards Canada on Twitter you'll have seen this news late last week. 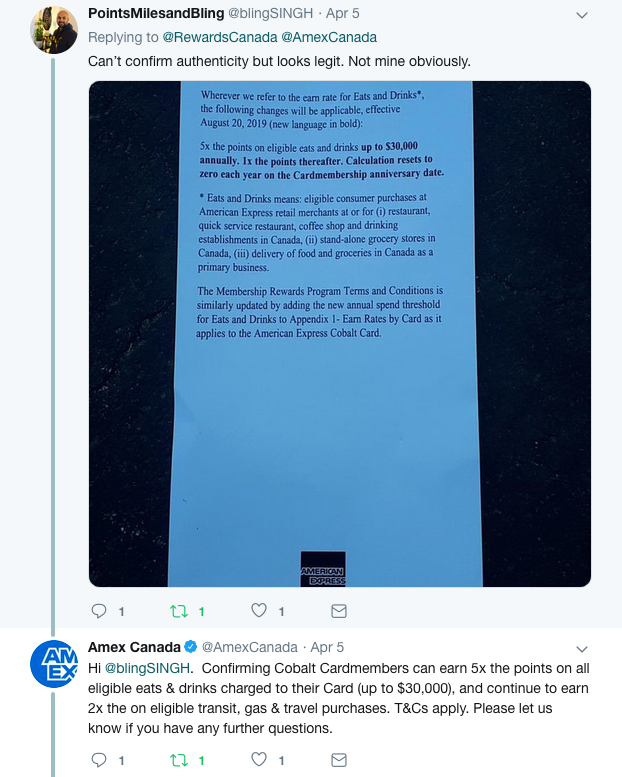 On Thursday Anshul at Points, Miles and Bling alerted us to a Reddit thread where someone who just received a new American Express Cobalt Card and the welcome package contained an insert. This insert stated that as of August 20, 2019 the card would earn 5x points on the Eats & Drinks for annual spending up to $30,000. After that amount the earn rate drops to 1 point per dollar. and the $30,000 annual cap resets to zero on the card anniversary date. I emailed American Express on Thursday night and received a response around the same time the American Express social media team on Twitter confirmed this change. 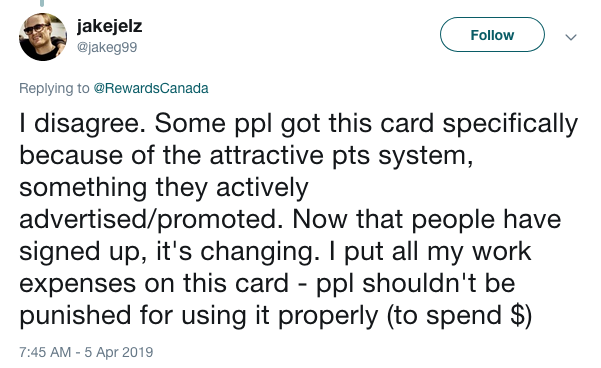 This is not the news any of us like to hear that what was once heralded as unlimited earning and a major reason this card is ranked number one in Canada, is now being curtailed. I did wonder, as many others did, how could American Express offer 5x unlimited points on the eats and drinks category and many speculated it wouldn't last and they were right. At least the category rate has not been cut, it stays at 5x points but like some of this card's competitors there is now a spending cap for that category. Or if you take the example of the Capital One Aspire World Elite Mastercard, at least the card isn't being totally discontinued since the economics of even 2% back on all spending for that card was too much for them. If you can take it as such, the good news is that the spending cap will reset/start on August 20th. So if you have already spent $30,000 on the card in this category or will before August 20, you get to start at zero that day and spend to your heart's content until you hit $30,000 to ensure you are earning the most points possible. Both of the above tweets are valid - neither is wrong. When American Express came out with this card in 2017 it was being targeted to the Millennial demographic based on the points earning system, the welcome bonus split monthly and the annual fee also being charged on a monthly basis. The mistake they made is that the strength of the earn wasn't lost on all the other demographics. Heck, we touted it as a great card for anyone and everyone, not just Millennials, that's why we ranked it number one. I pushed this card on families as there many out there who spend a lot of money on eats and drinks and they can easily break the $30,000 level. I know we do here at the Rewards Canada family. 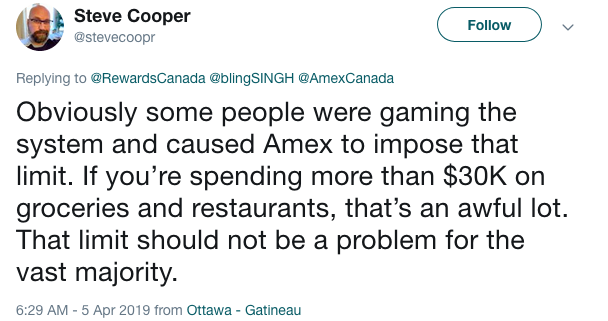 I also believe it wasn't only gamers of the system who may have forced this change but all of us Baby Boomers and Gen X'ers who can spend and do spend on a lot in this famed category. Still I would believe we probably only make up 20-30% of the Cobalt cardholders out there but as Jake states, we are losing out even for using the card properly. Add in the Millennials who do play the points and miles game and it has become too much. Get a second card - My wife and I each have our own Cobalt accounts which means we will each have a $30,000 cap effectively allowing us to spend $60,000 per year on Eats and Drinks and get the 5x points on all that spending. Ultimately you will need to run your numbers and see what works best for you. I believe most Canadians, at least the demographic that is targeted by this card, which are Millennials won't be affected by this change. Who will be affected are those of us who do spend lots on the card, either with legitimate purchases or those gaming the system. 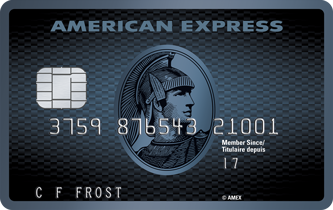 It's all about give and take, American Express gave and some really took to maximize their earning and now it's changing. This is the vicious cycle we are part of in the wacky world of loyalty. Let us know your thoughts in the comments section below! Will you be keeping the card? Moving to another? Maybe keeping it to spend to $30,000 and then getting another card for more spending? Let us know below!